Super tender, extremely buttery, slightly sweet scones spiked with eggnog and cinnamon chips. I made you scones. Tender, buttery scones with a hint of eggnog and nutmeg. Nom! Guess what? I’m going to teach you how to make them. Scones like their ingredients cold. Start by cutting a stick of unsalted butter into 1/2-inch cubes. Place the butter cubes on a plate and place the plate in the freezer for 2-3 minutes to get chilly. In a measuring cup, whisk together the eggnog, egg, and vanilla extract and place in the refrigerator until you’re ready to use. My grandmother taught me a trick a few years ago when she was teaching me how to make biscuits. Place your bowl in the freezer for a few minutes to chill before adding the dry ingredients. The cold bowl keeps the butter from getting soft. Using a pastry cutter, cut the butter into the flour mixture until it resembles a coarse crumb. The mixture should stick together slightly when you pinch it between your fingers. Grab your eggnog mixture out of the fridge and gently stir it into the dry mixture until just combined. Add the cinnamon chips and mix to combine. Mix until the dough just comes together, no longer. Over mixing will yield dense scones. Bake the scones in a 400 degree oven until golden brown. You can use this scone recipe as a base to add any flavor you like. Replace the eggnog for buttermilk. Like nuts? Add a handful. Dried fruit? Sure, why not. You make this recipe your own by adding your favorite scone fixin’s. Serve warm with a side of creamy butter. I like to cut my scone in half, slather the two halves with butter, place the halves back together until the butter melts a bit, and chow down. These scones are extra special because they’re made with my favorite holiday beverage. I added some freshly grated nutmeg to the dough to boost the flavor of the eggnog and a handful of cinnamon chips for a pop of spicy sweetness. The moist, buttery center is slightly sweet and pillowy with a hint of eggnog and a burst of cinnamon. These are no ordinary scones. Preheat the oven to 400 degrees F. Line a baking sheet with a silicone mat or parchment. In a measuring cup, whisk together the eggnog, egg, and vanilla extract. Place the mixture in the refrigerator until ready to use. Add the cold butter cubes to the dry ingredients. Using a pastry cutter (or two forks), cut in the butter until the mixture resembles coarse crumbs. Using a wooden spoon or rubber spatula, gently stir in the eggnog mixture until just combined. Gently fold in the cinnamon chips. Transfer the mixture to a lightly floured surface. Gather and press the dough into a ball. Pressing down on the ball, shape into a 3/4-inch thick round disk, starting from the center and pressing out to the edges. Using a knife or pastry scrapper, cut the dough into 8 triangular pieces. Transfer the dough to your prepared baking sheet, spacing the scones 3-inches apart. Bake for 18-20 minutes, or until golden brown in color. They’re so buttery, Julia. I had to give them away so I wouldn’t eat the entire batch by myself. Thanks! You know I have to try these ASAP! Love these! I know you love your scones, Jess. Thanks! you are amazing, cannot get over how perfect these scones look! Yes — I walked past the eggnog display at the grocery store last night, and had a huge desire to make some eggnog baked goods. I might have to start with these lovely looking scones. And keeping the mixing bowl in the fridge is a great idea! What a great idea from your grandmother! Thanks, Jamie. I couldn’t wait a minute longer; I had to make something with eggnog. I love the stuff. Let me know how you like them if you make them. I love scones! The biscuits amazing cousin. Great tip about chilling the bowl. I never thought to do that. Thanks, Stef! I love me some scones. I think it’s all the delicious butter. Love your scone tips, Jennie! These are some GAWgeous scones. I think Santa might like a little change. Thanks, Sarah! Fabulous tutorial! I just recently discovered how fabulous a scone could be and have been on a mission to create the perfect scone! Love your grandma’s tip and will definitely try it on my next endeveour. I get closer each time! Thanks again! Thanks so much, Liz. I hope your next batch of scones are perfect. Happy baking! Warm scones are heavenly, especially with those cinnamon chips and I love all those photos Jennie! Thanks, Susan. Those cinnamon chips take the scones over the top. Thanks for this tutorial, Jen. I LOVE scones but have yet to make a perfect batch. I’m loving the eggnog/holiday flavour here and can’t wait to try with all your tips. Thanks, Nancy. I wanted to show readers that scones aren’t intimidating at all. I’m obsessed with eggnog during the holidays. It’s full of delicious fat that I know isn’t great for the hips, but it’s the holidays, right? Just had my first round of egg nog this week (love it!) but I never thought to put it into scones. Done and done! It’s so good in scones. I didn’t start baking with it until this year. Crazy, right? Yum! These look so wonderful! These definitely DO NOT sounds like ordinary scones! Extraordinary! I’m not a huge fan of eggnog when it comes to drinking it. 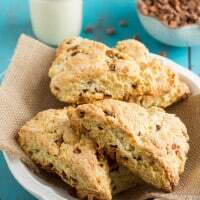 I think it’s a textural thing for me ;) BUT I loooove using it in holiday baking so I can practically taste how amazing these unique scones must be with the eggnog and scattering of cinnamon chips. Love! Thanks, Terra. I thought it would ease readers into the process, show them how easy it is. Happy baking! Great tutorial and delicious looking scones! Thanks! I’m so happy you like my tutorial! Scones can be intimidating and tricky. You’ll be a scone expert for sure now. I make scones almost weekly- it is such a relaxing way to start the day. Love your tutorial! Those are absolutely gorgeous! Love all the great tips for scones in your post! And I love that these have eggnog in them…I am all over that holiday drink right now! These look gorgeous, girl! I love eggnog & could easily gobble up a few of these delicious scones! Perfect for holiday brunches!